Recycling paper is probably the most straight forward. Junk mail, newspapers, printouts all get thrown in your bin. No issues there, but take a look to see if all of your recycled paper passes the following checklist. Hopefully that is a pretty comprehensive list. You can always call your local recycling center if you have a specific question. And don't forget to look for recycled paper products when you're making your purchases! Here are some things to remember about recycling plastics as you try to embark on a more green lifestyle. DO recycle any bottle or jug with a neck narrower than the bottle. DO check with your recycling center on what they accept, usually types 1 through 7. DON'T throw the cap in with it, they are made of a different kind of plastic. DON'T worry about peeling off labels, they will be removed in processing. DO remove the spray bottle attachment. DON'T include plastic bags, they are accepted but they can clog the machines. 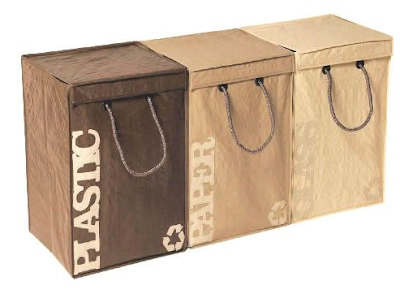 Most retail stores have a box specifically for bag recycling. DO make sure the bottles are empty. DON'T get too bogged down with the rules. Most of them are pretty obvious and preventable. The important thing to remember is DO recycle! Between bills, junk mail, newspaper, and handouts, it seems that paper always ends up in our homes. You would think that it's goal in life is to bury us all alive! We've gathered a few tips to help you cut out the paper clutter in your life. 1. Unsubscribe! Call the company or visit catalogchoice.org to opt out of the catalogs that you don't care about. Better yet, opt out of all of them and do all of your browsing online! 2. Split a subscription. Do you have a friend with the same magazine taste as you? Share a subscription with them and just pass the magazine along when you're finished reading it. When you've both read it, donate it to a local doctor's office or nursing home. 3. Buy online subscriptions. Newspapers and magazines offer online subscriptions, often at a lower cost. Read your news on your laptop! Most eReaders have the capability to feed newspaper articles. Extra bonus? No black newsprint on your fingers and no fighting with that giant paper! 4. Avoid paper towels. Dry your hands on a dish towel, clean with old t-shirts or towels, use cloth napkins. It's shocking how commercials have made us think that we need paper towels to wipe a spill. Do you know what's more absorbant than paper? Cloth! And it's reusable. Win win, my friend! 5. Online bill pay. Not only does it save you the cost of stamps and checks, it prevents the waste of paper bills and envelopes. Most companies offer a free monthly reminder via email along with electronic statements. They are available to you any time by a simple search! No more bursting file cabinets! Obviously there are some times when receiving paper in unavoidable. When you have to purchase paper, choose the recycled option. And when you're done, put it right back in your recycle bin! One of the highlights of summer is the abundance of fresh produce! Am I right? There is nothing tastier than a piece of fruit picked straight from the plant, or a variety of veggies hanging out on the grill. Buying produce in season isn't only the most delicious way to cook, it's also the most affordable. Plan your menu around that month's produce. To give you a hand, I dug up a list of the best fruits and vegetables to eat in July! I'd love to hear some of your favorite ways to prepare some of these items. I'll see what I can find, maybe I'll share a few recipes with you! I think we can all agree that our pets are our family too. We feed them, love them, take them to the doctor, and chat with them every day. So it's important that we don't forget about the impact they make on the environment, as well as the impact the products we use have on them! Here are a few of our picks for eco-friendly pet products. There are probably more "proper" ways of wording that... but it is what it is! Neighbors, park attendees, and your barefooted spouse all thank you for your commitment to cleaning up after your dog. Listen, we all love our dogs, but we don't need to keep their waste around in a plastic bag until the end of time. Let it break down! Unless you are one of those special types of pet owners, your pet probably eats and drinks from bowls on the ground. Stay away from plastics since they absorb bacteria. Find a nice ceramic bowl that is lead free and dishwasher safe. A collar is to a pet as shoes are to a woman. They are functional items, yes, but they are also an accessory to show off a bit of personality. A simple Google search will provide you with a million eco friendly collar options. And OH THE CUTENESS! If you're spending time outdoors and the mosquitos are attacking you, chances are high that they are attacking your pet too. Find an organic and deet free spray to keep the pests away and keep your pet safe and healthy. Ha. Just wanted to see if you were paying attention. Protect your pets, friends. They are worth it! Not all trash is actually trash. We've already discussed recycling, that's an obvious way to cut back on the amount of junk you throw into a landfill. But what about composting? Some many things you normally toss into the garbage can actually break down on their own... quickly! Here are five simple tips to help with your compost pile. 1. Anything that was alive is a good candidate, except animal products. So vegetables, grass clippings, fallen leaves, etc. are all fantastic materials. 2. Your pile needs to be big enough for you to be able to turn it, yet small enough to retain heat. Most sources recommend about a 3' x 3' x 3' area. 3. Chop, tear, and clip! Make your materials small, so they break down in an appropriate amount of time. Shred the newspaper, chop up that apple core. Give your pile a hand. 4. Aerate! There are so many mixed reviews on this... Anywhere from 4 days to 2 months between turns. Your pile needs oxygen for all of the materials to break down, but you don't want to let the heat escape. My advice is to watch your pile and see what works best for you. 5. Just add water. Not a ton, but enough to make the pile damp. It's likely that the rain will do most of this work for you, but you may have to hose it down a bit each time you turn it. Compose piles aren't just for gardeners. We are well into June and my garden is virually non-existant, yet I keep adding to my compost pile. It makes me feel good to know that many of these items will be broken down and used for good instead of slowly rotting in a landfill. Plus, if I ever get my act together on that garden, I have some good compost waiting for me! Here at ForceOut we believe that it's important for a company to have values. Of course we make it a priority to provide grean cleaning products that work. You know, something that you can actually count on! Something that can handle the deep stains and the nasty odors, yet isn't harmful to those you love. At our core, we value those you love more than we value your clean home. I thought it would be a good gesture to tell you exactly what it is that ForceOut values. +The environment. Our products are green, which means you don't have to worry that you are destroying the earth for your great grandchildren each time you spray something. +Your children. You know that term "rugrats"?? Yeah, that term came about because of the ridiculous amount of time that little ones spend all over the floor. Get the chemicals off of the floor, don't spray their room with an aerosol can of junk. Their health is important, you know it and we know it! +Your pets. Pets are valuable extensions of our families. Their messes and smells have to be cleaned, we believe you should keep the chemicals away from them too. +Social good. We were all given a little bit of time here on earth, do something good with it! Share your joy, give a little something to someone less fortunate, bless someone with what you've been given! We aren't experts and we don't claim to have it all figured out. In fact, I'm very new to green living. But it's important to us and we're here to prove that every little bit helps, every green decision you make is a big step towards making our world a better place. We always welcome your ideas and your stories. Tell us how you're making a difference! Prior to 1982, the requirement for installing insulation while building a home was far lower than it is today. What does that mean for you? It means that you may need to add insulation! If you are like me and you live in an old neighborhood, chances are that you are wasting some valuable dollars on escaped energy. 2. Approximately $100-200 savings on your utlity bill each year. 3. Increased barrier against pollutants, therefore a cleaner air quality indoors. 4. Saved energy, promoting a greener lifestyle. 5. Consistant temperature in every room in the house. It's worth it to take a look. You may be shocked at how much of your precious air conditioning is leaving your home before you even get to enjoy it. I'm in Houston, Texas and we're on the back end of the month of May. What does that mean? Heat. I wouldn't say that we're experiencing the hottest May in recent history, but it's definitely not cold outside! I'm not really one to complain about the heat. As a born and raised Houstonian, I am used to triple digit temps! But as a homeowner? Well, I just can't get on board with that. I dread getting my bill each month, wondering if we're going to have to eat Ramen noodles for the month just to pay for our comfort! Well here's a tip, turn on your ceiling fan. I know, it seems like common sense. But here's the thing: You have to also turn up your AC. You see, when you turn on your ceiling fan it doesn't actually change the temperature in the room. It only changes how it feels on your skin. It's called the "wind chill effect" and it basically means that the air flow is making the perspiration on your skin evaporate even faster. For instance, if your room is 80 degrees and you turn on your ceiling fan, it'll feel like 72 degrees! Pretty nifty, huh? Crank that AC up a few degrees and put your savings aside for a nice summer treat... like ice cream or a giant block of ice! Let's chat about recycle bins. Fun, huh? I live in a neighborhood that doesn't provide curbside recycling, therefore doesn't provide recycle bins. And to be completely honest, it's a pain to remember to do it! My family doesn't use much glass or plastic besides the weekly container of juice and milk, so I'd like to have a bin that can hold all of our recyclables until I have enough to justify a trip to drop them off. I don't just want those open blue bins sitting in my kitchen, though. That's a bit of an eye sore. So I've been researching some other options and I'd like to share them with you. This one is likely what I'll get. It matches my trash can so that's a bonus. (That's a werid sentence, huh?) 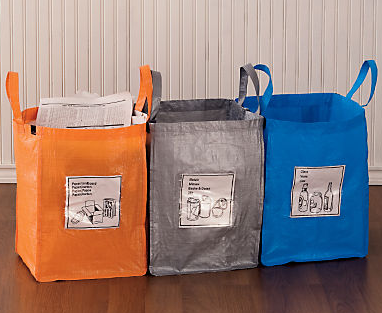 This type of bin is offered just about anywhere, so look for it wherever there is a sale or you have a coupon. This batch is great if you have space in your garage. I have space in my garage but I think that since I'm so new to this, I may run into an out-of-site-out-of-mind situation. I need mine to be visible. I love these but I was unable to find out where you can actually find them. The place I found them was in the UK and that's a bit of a trip for me! They sure are cute though. If you have little kids, these are perfect. You can label the outside with either a picture or a word to describe what belongs in each bin. You can find these at gaiam.com. I think they could be a great teaching tool! My son is only 8 months and I'm not sure I want him recycling his bottles and baby food containers... so we'll steer clear of this set! So there you have it. I'm glad there are more options out there other than gigantic blue bins. I guess I need to break down and go buy one so that I no longer have an excuse. I think it'll uncork a bottle of wine so I will have something to practice with!